Y'know, I remember the good old days. When games were nice and cheap and no-one really copied them. Well, they did, of course, but not in the same way they are now. Y'see, one of the most valid arguments pro-piracy (and believe me, I'm NOT pro-piracy, I just agree with this particular train of thought that games are too expensive, and that encourages piracy) is that each copied game is not REALLY a lost sale, it's a sale the developer was never going to have, and instead they get free word-of-mouth advertising if their game is really good. It's a weak argument, sure, but it's one that makes me think, "The Pirates have a point". Anyway, my point of view is that if a product is worth buying, and I can afford it, I'll support it. I've done it with Shareware, and had no complaints about doing it. So, if a developer comes up with something novel or interesting to frustrate pirates, then I'm all for it. But as things progress, things get more sophisticated. Games became able to detect themselves whether they had been been pirated, or even at risk of being pirated, and refused to run... or perhaps even stranger effects. Let's also not forget that anti-piracy methods also introduced us to the first PC Virus, the Pakistani Brain virus. Designed to protect a heart-monitoring program from piracy, (or rather track it) it soon spread to the UK and US. It didn't actually do any damage, thankfully, but still people rang the programmers asking for their computers to be "vaccinated" in their thousands. So here are my favourite anti-piracy or copy protection schemes, and some of them I'd actually really like to see in action. 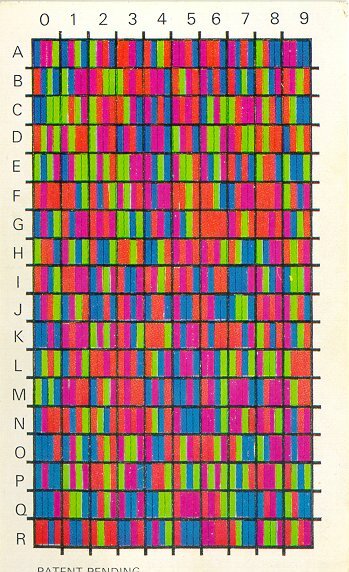 The code sheet was nothing more than a list of numbers (or in JSW's case, Colours), an entry from which would be required on loading the game. Simple, quick and downright straightforward to circumvent by copying the code sheet. Worms made life harder by printing it black-on-black so that you couldn't very well photocopy it, but a dab hand at Excel could copy it within an hour or so. It's pretty obvious how this works... The game requests the code from Column A, Row X, you look it up and type it in. JSW provides you with a key to the colours and what numbers they represent, which is nice. Not much more can be said about this. It's as basic as it gets. Designed to be overly complicated to copy, Code Wheels were actually a pretty simple concept. The game will show you a picture or something, made of two distinct halves. Take your code wheel, turn it to make that picture. Then read the code from the indicated window. Tap it in, and joy! Your game runs. Get it wrong, and you'll probably get another chance. Get it wrong again and the game will probably reset itself. Annoying, huh? And since the windows are all over the place, it's not so straightforward to calculate their positions. Genius! Oh, did I mention the black-on-black writing used for Zool? Impossible to read! Wahey! At least it was impossible to photocopy. Actually, not everyone had the foresight to use black-on-black, Lucasarts' code wheels for the Monkey Island games, for instance. 15 Photocopies is all you need. Not something that would put off the serious pirate. Again, though, this wasn't going to STOP piracy, just discourage it slightly. Anyone with patience could actually copy the numbers in a spreadsheet, if they were that determined to copy a game. Ah, one of those things that always gets the little "TM" after its name. I might change my name to Fishsta(TM). Ahem. 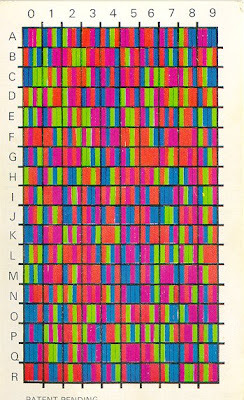 Anyway, I remember my mum deciding it would be a good idea to get me a mouse and Art Program for the Spectrum. And you know what, it wasn't bad. 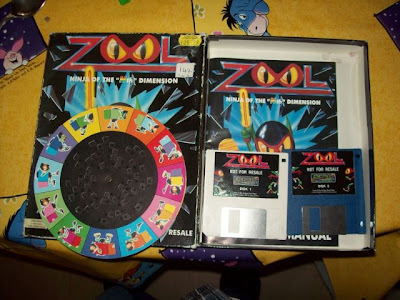 But it introduced me to what was probably the best copy protection system I'd ever seen. No, really. You ask any Retro-head about Lenslok, and they'll tell you what a stupid, crap, unreliable system it was. I personally never had a problem with it, and I found it GENIUS. Take a look in this box here, and you'll notice the red thing. That's the Lenslok "lens". So, you load your game/art software up, and then you are presented with the first stage of the protection... measuring your lenslok. No, really. You hold the thing up to the screen (fully unfolded) against a large letter "H", and using a couple of keys on the keyboard, adjust the width of it until it matches the length of your Lenslok. Press Enter to move onto the next stage, the "dry run test" stage. Now you fold the Lenslok so that it resembles a map-reading magnifier. Hold it against the screen, centered on the middle of the "H". The plastic bit in the middle acts like a prism, distorting your view of that portion of the screen. If you look at the screen without the Lenslok, you'll just see a garbled mess, the distorted view through the Lenslok actually makes sense of it, and you should be able to read 2 letters, at this point they should be "O" and "K". Once you're happy with that, keep the Lenslok in place and press enter. Two new letters appear, type them in, and off you go. So, what were the problems? Well, the idea of measuring your lenslok on the screen was so that the size of your TV or monitor wasn't a problem, but with the limited resolution of home computers, sometimes it was. And, of course, constantly bending plastic back and forth will eventually break it, even if that's what it was designed to do. It sounds as though I was lucky, really. Modern day In-Built Copy/Crack detection - Having fun with the Pirates! Now for my FAVOURITE part. You've done what you can to stop piracy, and it still happens. It always will. It's never going to stop. So make it a game itself, then. Mess with the pirates heads, annoy them, frustrate them, do whatever you can to delay "Day Zero" hacked versions appearing. It's been going on for a while. Just ask anyone who knows their stuff about Spyro or Earthbound. 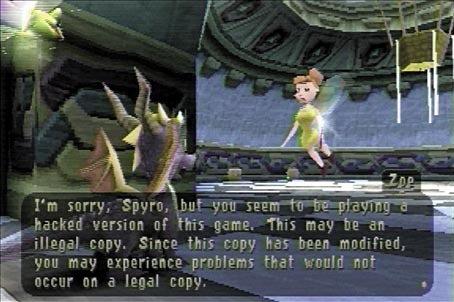 These used multi-layered protection which worked so that the game would detect unauthorised copies at several points, and cause undesirable operation throughout the game. The game lets you know right away that it knows it's copied (Spyro actually tells you outright, "I'm sorry, Spyro, but you seem to be playing a hacked version of this game..." it really couldn't be any clearer) but crackers persisted and EVENTUALLY beat all the layers, which would include surprises like more and tougher enemies, settings changes and even the famous "crash and delete your savegames" trick. What could be worse than a generic dancing game cashing in on Michael Jackson's awesome music and dancing skills? How about getting into a game to be treated to the sound of the Vuvuzela over the soundtrack? Yeah, that'll put the pirates off, more than replacing all songs with DJ Otis' "Hey Baby!" But... but... 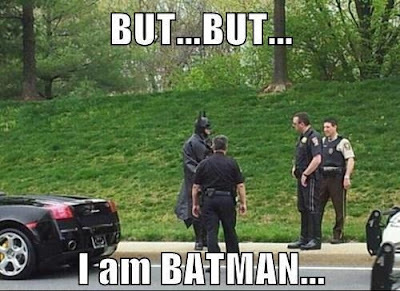 I am BATMAN. I cannot have my abilities taken away, surely? If you're a pirate, yes, you'll lose the ability to Bat Glide. Since there's parts of the game where you HAVE to glide to survive, you'll only get so far before you hit a brick wall. And the best bit? Someone posted on a forum about the problem they were having, only to be told outright, "It's not a bug in the program code, it's a bug in YOUR moral code". Awesome. This one I'd really like to see. Apparently, a new technology called "FADE" was introduced, which basically SLOWLY broke the game. It started messing with the camera, and lowering your weapon's accuracy and power, until eventually they were as useless as pea-shooters. And finally, you get a message, "Original Discs don't FADE". It sounds pretty cool. I have to take my hat off to this one, this is brilliance. And again, this is one I want to EXPERIENCE. The game plays as normal... for about 30 seconds. Just after you collect your first gun, you run into what is now known as the "DRM Scorpion". Nope, that doesn't seem to work. Maybe a game of cat and mouse, in and out of cover, get as many hits in as you can? Maybe you should stop wasting your time, pirate. The DRM Scorpion is immortal. He will persist in chasing you until he kills you. Although apparently you can get through the first couple of levels, the difficulty curve isn't just steep, it's vertical. Don't worry, though. Even the best gameplayers will get stuck when the second protection system kicks in... all of a sudden you'll look up to the sky and start spinning on the spot. Meanwhile, any bad guys in the area will take this oppurtunity to kill you. Is that the last of the protection systems? Maybe... maybe not. 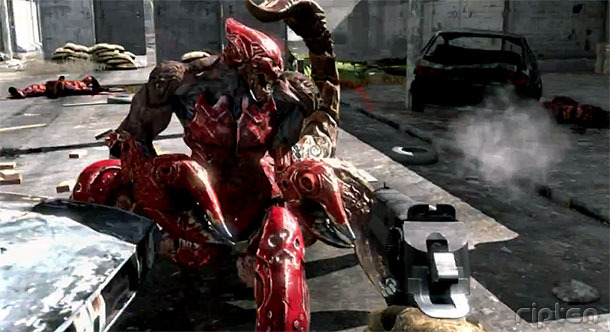 But the Scorpion alone sounds too awesome to miss. The regrettable thing is that it's tempting for even a non-pirate to pirate the game just to see it. This must be one of the rare occasions where the pirates get more content than the people who hand their money over for a legitimate copy. Maybe not such a wise move? GTAIV used FADE too. Spinning cameras that wouldn't stay still ETC. Didn't take long to hack it IIRC but enough to make me buy the game (something I will always regret given how sloppy and bad it was on PC). 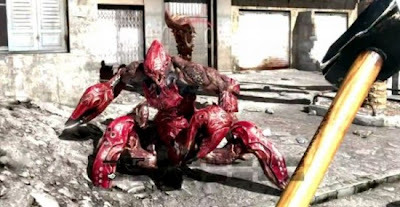 There was also protection like that in Half Life 2. It would let you get so far and then all of a sudden the characters in the game would just stand still and refuse to speak, screwing you (Alex opens a lift for you for example).